Published: Aug 26, 2015 to ? 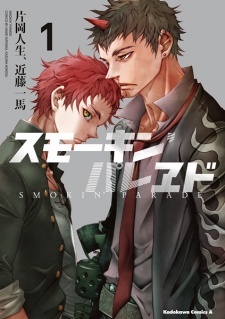 Smokin' Parade has been published in English by Yen Press since February 21, 2017. From the creators of Deadman Wonderland comes Edgy Gory Avengers Against FNAF Characters with Added BL. In other words, Smokin' Parade. And maybe Suicide Squad. First of all, this is nothing like Deadman Wonderland. It is completely different aside from the art style. If you've read a summary, it's about a boy who joins an organization against these things called "Spiders." As of now the manga has six chapters and the plot is basically: "Let's go around doing missions and killing Spiders." with some black comedy and every chance to add gore scenes and uncomfortable, crazed faces to make the reader uncomfortable. Heck, the first chapter is basically shock value 101. Artwork is great if you're a fan of this mangaka. I don't particularly enjoy how the panels are and how everyone always makes inhuman poses when they are fighting, etc and half of the time I don't know what is actualy happening. Why they take every chance a character appears to make an outlandish, edgy face while showing off how cool and fucked up they are, who knows, but coming from Deadman Wonderland I expected this. Like I said, Suicide Squad. You're probably wondering why I mentioned BL, well there seems to be some strange relationship between the leader of the organization and the MC, and there's a member who is obsessed with the leader and jealous of the MC for getting so much attention from his boss(crush). Also look at those covers, need I say more? There's also some strange steam punk going on even if its set in Modern Japan. And the scientific aspect of everything that is even supposed to be happening on what the Spiders are but that dwells into spoilers. I don't believe Smokin' Parade will get better, as of now it just stands as a typical, gory action packed manga with no sense of direction in the plot and a lot of scenes of blood and limbs used for shock value. Also fan service, can't forget that. If you enjoy manga with a cast of characters in an organization of morally ambiguous heroes who are wacky and fucked up and seeing the development of a boring MC who is typical of this type of genre this is the manga for you. In spirit, Smokin' Parade almost transmits us the same gore vibe than Deadman, which is still great, but it fails in putting the reader inside the ambient, i would say because there is just too simple character development in each chapter. It follows a story of a group that kills "spiders" and in each chapter you have a new enemy with a new simple motivation and low deepening but with considerable reasons to do what they do. Considering it's a manga about a group of people killing and joking around, the character development is really shallow and don't trasmit enough empathy in any way. The best example of character development is the boy in the first chapter and his backstory, but it's like he had just vanished from being a singular character since he entered the group. They act as if they were completely neutral about their lives and don't show any back motives whatsoever. Aside of this, the story goes well and at least i could apreciate each chapter so far. The art is great, the character models aren't too much abstract and keeps the badass vibe. The problem is that in the fight scenes, sometimes you have too much going on and can't understand it properly. But still enjoyable. There is a richness of details in this that i like very much. Until now, it was made of a simple story telling purely based on intense action and some comic relief which in every episode you have a new situation but with a bigger plot running in the background. It turns out to be just a story about the group living it's daylife killing 'spiders' and joking about it. It's not bad, but it's a simplistic way to tell a simple story which remembers me a lot of DG Killer Killer.